Benjamin Franklin used this now-famous cartoon, created by an unknown artist, more than once. He first published it, to make a political point, in his Philadelphia-based Pennsylvania Gazette on the 9th of May, 1754. It is the earliest-known work, by a colonial American, which advocates union of the colonies. It is also the earliest-known American cartoon used to make a political statement. 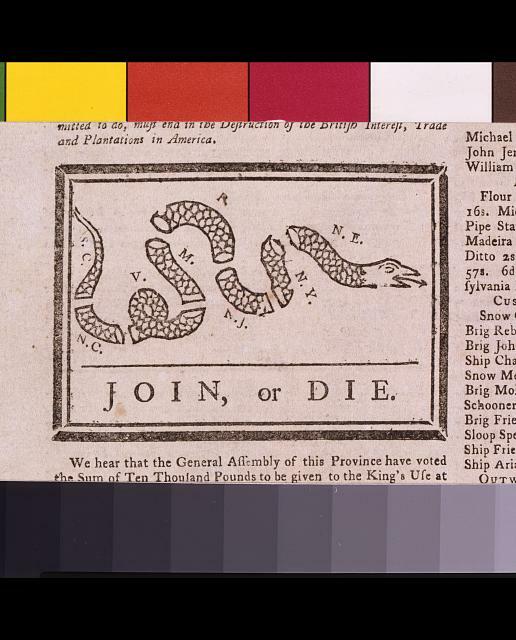 Benjamin Franklin's warning to the British colonies in America "join or die" exhorting them to unite against the French and the Natives, shows a segmented snake, "S.C., N.C., V., M., P., N.J., N.Y., [and] N.E. [the four colonies also known as New England]." If we closely study this political cartoon, we notice that two of the thirteen colonies—Delaware and Georgia—are not referenced at all. Why not? Georgia (then a frontier colony) had virtually no effective government at all (with only three laws having been enacted by the time of Franklin's 1754 article). Georgia's impact (at that time in the colony's existence) wouldn't add much to a joint effort. Leaving Delaware and Georgia out of the illustration also tracks with the "Albany Plan of Union." That was an early effort, supported by Ben Franklin, which colonial leaders debated during the summer of 1754. The idea was for the colonies to band together on common-interest issues. The Albany Plan was not conceived out of a desire to secure independence from Great Britain. Many colonial commissioners actually wished to increase imperial authority in the colonies. Its framers saw it instead as a means to reform colonial-imperial relations and to recognize that the colonies collectively shared certain common interests. There's something else to know about the image Franklin selected. It's related to a superstition, then bandied about, that if a snake were cut into pieces, it would become alive again if those pieces were rejoined before sunset. Image, U.S. National Archives. Original woodcut created by an unknown artist. In-line image of the 9 May 1754 "Pennsylvania Gazette" article, featuring the referenced woodcut, online via the U.S. National Archives "Founders Online." Bos, Carole "Join, or Die - Ben Franklin and the Political Cartoon" AwesomeStories.com. Sep 03, 2017. Apr 21, 2019.